James Harris Gallery | Alexander Kroll: "Volta NY"
Alexander Kroll’s works utilize tactility and pictorial space to assert the painted object as a vehicle of presence. Kroll conceives of the pictorial surface as a space to consolidate a diverse set of relationships between body, mind, support, and surface whose specific interplay activates the work as its own context and closed system of signification. Kroll’s assertion of painting as intellectual construction forms the basis for encounters of unmediated relational intensity between artist and object as well as object and viewer. 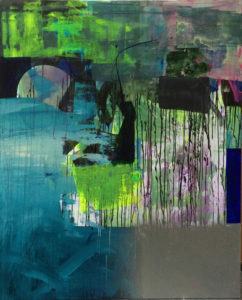 Individually, Kroll’s compositions represent a collision of ideas that often culminate into the illusionistic space of ethereal landscapes, particularly in his large-scale pieces. 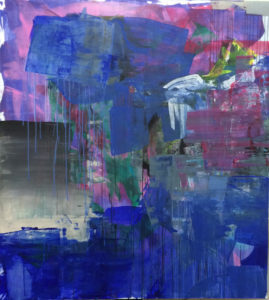 These paintings are softer and flatter than his previous works, with a liquidity emerging in the form of emotionally-activated drips and splatters, and sheer veils of light and color blending like glass. 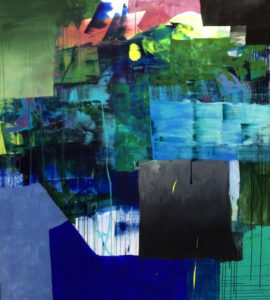 Rather than pushing outwardly from the canvas with the thick materiality of the paint, Kroll’s new works lure the viewer into their veiled lacuna in an exploration of what lies beneath each layer. But more often, these works concern themselves with their capacity to assert an identity as a whole, with each subtle articulation adding to the narrative in much the same way that a sitter in a portrait is recognized by their expressive idiosyncrasies. 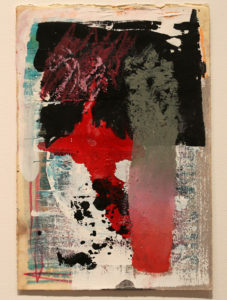 The layering of information within Kroll’s paintings extends beyond the physical presence of the work of art, however. With his captivating pictorial fields, Kroll presents us with intriguing new realms that are both enterable and static, an anomaly of spatial navigation in painting that is as innovative as it is assured. Alexander Kroll is a painter that works mainly in an abstract expressionist style. However, his works have fluorescent color palettes and are made on a large-scale to bring them into the contemporary art world. 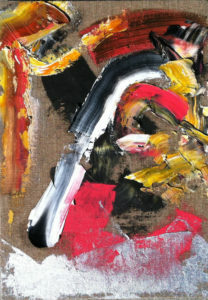 The colors in his works are layered and work together in ways that create a kind of rhythm in the works. It also allows viewers to see the process of how Kroll’s works came to be. Painting, for the artist, is a conversation in which one mark leads to the next; and one completed work leads to another. 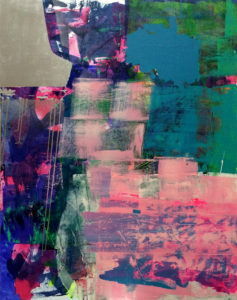 His work has been exhibited at CB1 Gallery (Los Angeles, CA), ACME, (Los Angeles, CA), Lincoln Center (New York, NY), Torrance Art Museum, (Torrance, CA), Jessica Silverman Gallery, (San Francisco, CA), The UCLA New Wight Gallery (Los Angeles, CA), The Ben Maltz Gallery at Otis College of Art and Design (Los Angeles, CA), The Armory Center for the Arts (Pasadena, CA) and many others. 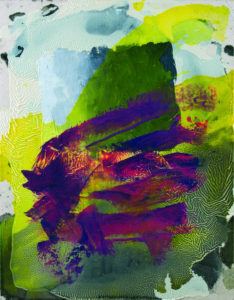 Kroll received his BA from Yale University followed by MFA from Otis College of Art and Design in 2008. He currently lives and works in Los Angeles, California.